We were heading from Oakland to my father-in-law's place in the South Side hills when we saw this weird church tower on a corner floating alone against a modern office tower. 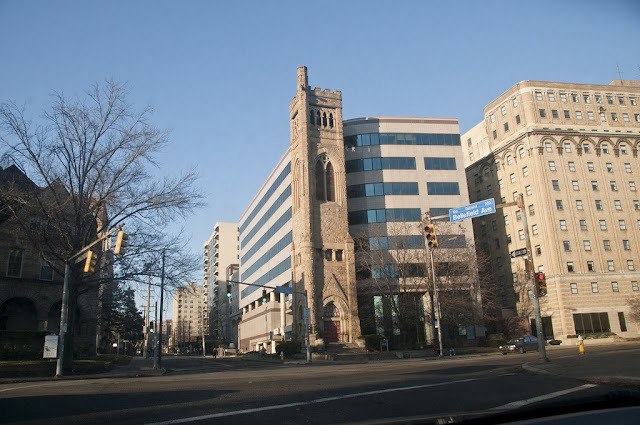 I looked up what it was, and it turns out the tower once belonged to the Bellefield Presbyterian Church (built in 1889), which merged with a nearby church in 1967 and most of the original structure was torn down in 1985. The developer of the office tower sawed off and sealed up the original bell tower, though it contains no bell today. There is no real reason for it to be there, but there's something kind of lovely about that, isn't there?